Some prefer to visit museums and historic sites while on Vacation, but others prefer adventures in nature. You may wish to breathe fresh air on invigorating walks or take things to the next level with rock climbing or snorkeling. Either way, you’ll want to plan an outdoor adventure in one of these three towns the next time you head out on vacation. Arizona’s dry climate is perfect for those who want heat but hate humidity. Though summers can get relatively hot, winters are mild, and you can enjoy outdoor adventures for most of the year comfortably in Phoenix. Whether you want to go hiking in the red rocks, take an ATV tour of the landscape, or view Phoenix from above in a hot air balloon, you’ll love the plethora of outdoor things to do when you visit Arizona. To make your outdoor adventures more convenient, choose your Phoenix hotel near the spots you’ll be exploring. Four Points by Sheraton Phoenix South Mountain is situated right near South Mountain Park and offers comfortable amenities like free Wi-Fi and an outdoor seating area. Downtown Phoenix hotels such as the Renaissance Phoenix Downtown perfectly situate you for grabbing dinner and drinks before bed after a long day of being in the sun. 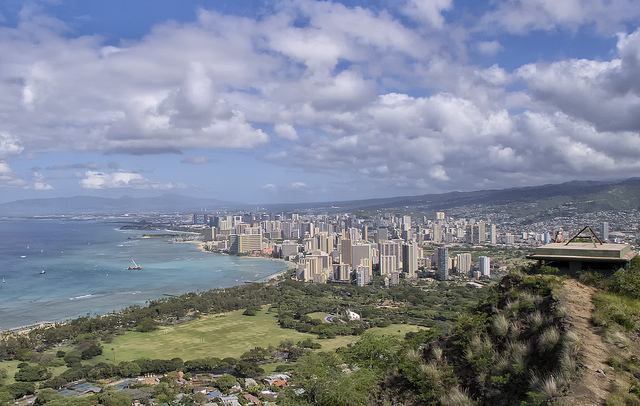 Let’s be real: Honolulu is so beautiful, you probably won’t want to go inside the entire time you’re there. If you do one water activity while visiting, make it snorkeling. You’ll see coral reefs and wildlife in crystal clear turquoise water. For those who prefer to stay above the water, kayaking is a fun group activity. So is hiking to Diamond Head Crater or Manoa Waterfall. Because Honolulu is a vacation destination, you probably expect the hotels there to be expensive. However, if you book during low season or shoulder season, you can get Honolulu hotels with great accommodations in or near Waikiki for very affordable rates. The Aston at Waikiki Banyan and the Hilton Garden Inn Waikiki Beach have beautiful rooms at budget-friendly prices. If you truly want to live it up, splurge on the Grand Waikikian Suites by Hilton Grand Vacations. Pigeon Forge sits near Tennessee’s gorgeous Great Smoky Mountains, making it a perfect base of operations for anyone wanting to hike or camp in the mountain range. You might consider hopping on a bike and riding the trails, driving through the scenic roads, or seeing elk at the Great Smoky Mountains National Park. The hotels in Pigeon Forge are mostly arrayed along Highway 441, which becomes Highway 321 right near the Island in Pigeon Forge. Vacation Lodge and the Creekstone Inn will both put you within easy driving distance of the national park for very affordable rates. If you want to be pampered, the RiverStone Resort and Spa is the premiere upscale accommodations in Pigeon Forge. Nothing beats the views and the experiences you have while adventuring outdoors. From the Great Smoky Mountains to the depths of the Pacific Ocean, you’ll be so glad you visited these vacation spots.